The room was packed, and I think the talk went very well. In fact, the Q&A was so lively and went on for so long that I actually got “played off the stage” with music to make room for the next speaker! And the huddle around the stage lasted considerably longer. So I guess I at least I got people thinking and talking. 😉 I was also pleasantly surprised to see a torrent of positive real-time reviews in the twitter-sphere (archived screenshot). 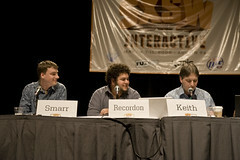 My talk was live-blogged by Andrew Mager and Mark Scrimshire (thanks, guys! ), and John McCrea even shot some video. It’s very exciting to be in the middle of such a transformative period in the Web. 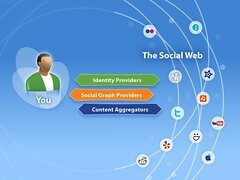 I firmly believe we’re on the cusp of the next major phase of the Web–the social web–and that a new layer of service providers are emerging to empower users to interact with the thousands of socially-enabled sites and services: identity providers, content aggregators, and social graph providers. 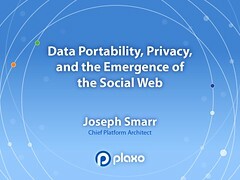 There are examples of companies today that fulfill one or more of these rolls, and Plaxo is certainly going to participate in all of them, but we’re all just getting started, and–as I find myself saying more and more–you ain’t seen nothing yet!